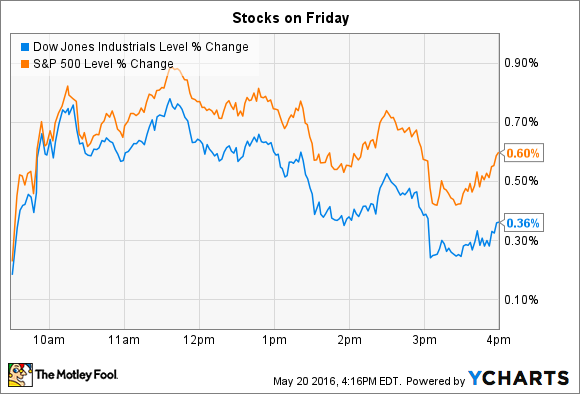 Find out why these stocks broke away from broader indexes on Friday. In economic news, the pace of existing home sales improved by 2% in April, according to updated statistics from the National Association of Realtors that showed continued strength in the housing market. The growth was just above economist forecasts and notable, given that average home prices also jumped 6% higher year-over-year to reach $219,000. As for individual stocks, Applied Materials (NASDAQ:AMAT) and Campbell Soup (NYSE:CPB) both made large moves on Friday after posting quarterly results ahead of the opening bell. Applied Materials stock jumped 14% after the semiconductor giant announced encouraging business results. Sales for its fiscal second quarter were flat, but new orders spiked higher by 37%, led by huge gains in its display division. A slight uptick in operating margin also helped push adjusted net income up by 4%, while a sinking share count helped turn that into a 17% jump in earnings per share. Applied Materials beat consensus earnings estimates for $0.32 per share by $0.02. CEO Gary Dickerson credited several favorable trends for powering the order spike, including its expansion outside of the semiconductor space into areas like OLED display, where it can apply its unique materials innovation know-how. "This is creating significant new market opportunities for Applied," Dickerson told investors in a conference call. Wall Street was even happier about the company's bullish outlook, which incorporates the surge in orders to forecast 16% higher sales in the fiscal third quarter (analysts had been bracing for just a 2% revenue improvement). The global environment for capital spending is spotty, but executives see their strong position in growing segments like OLED and in key markets like China as cushioning the company from any decline. In fact, Dickerson and his team project record earnings this year. With its order backlog sitting at a nine-year high, that looks like an achievable goal. Packaged foods specialist Campbell Soup was the biggest percentage-point loser in the S&P 500, dropping 7% following the release of its fiscal third quarter earnings results. Sales growth turned negative after holding steady over the prior six months, a shift which management blamed on three big factors: a weak soup season in the United States, lower V8 sales, and a weather-related disruption in its fresh carrot supply. The company had to contend with what executives called a "very challenging consumer environment" that hurt results by forcing higher marketing and promotions spending. Cost cuts offset most of the increased expenses, but revenue still slipped lower than planned. "We're unsatisfied with our third quarter organic sales growth," CEO Denise Morrison said in a press release. Morrison noted that management is aware of the factors that pinched results this quarter and is addressing them all. That's why the company left its full-year revenue outlook unchanged and even raised its profit forecast slightly. However, Wall Street is apparently more concerned with the shift to negative growth, especially as Campbell Soup's shares were close to all-time highs heading into this report.